Reports from VR-Zone suggest that AMD would launch its flagship Dual Chip “Radeon HD 7990” by the mid of this month although in very limited quantities. AMD has always tackled NVIDIA by launching their dual chip monstrosity first but now its been almost 2 months since NVIDIA launched their GTX 690 Dual Kepler GK104 graphics card while AMD has yet to launch a competitor. Based on two Southern Island based Tahiti XT cores, the HD 7990 would offer 4096 stream processors and upto 12GB GDDR5 memory (6GB on each GPU) along a 384×2 bit wide memory interface. The newly added Boost feature to the 7970GHz and upcoming 7950GHz edition would also be seen on the 7990. 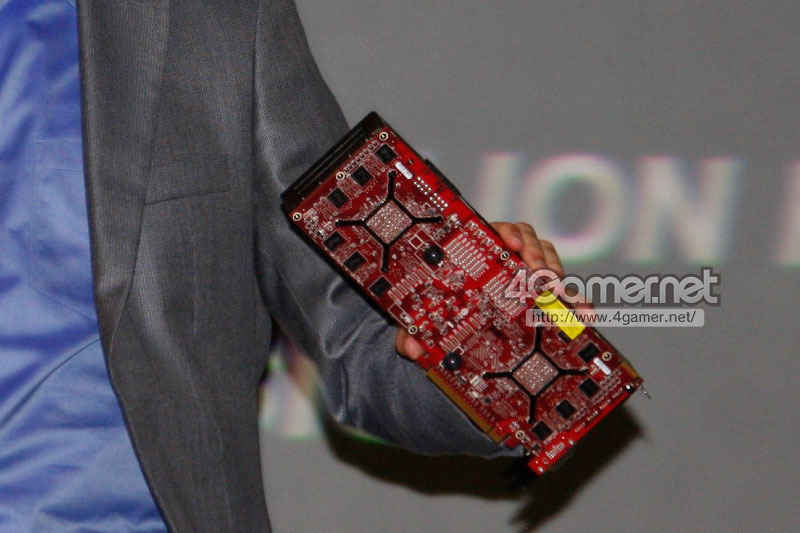 We can also confirm 12GB of Vram since the FirePro W9000 which was showcased at the AMD Fusion developer summit also had 7 memory chips on the back of the PCB which means 6GB vram for each core. Vr-zone also confirms that AMD has the card running up in their labs and we could see the beast in the upcoming days.